I bought tickets to see Mozart’s Don Giovanni today, and of course the first thing that came to mind was Amadeus. Because that is without a doubt the coolest movie ever made about Mozart. Maybe that sounds like faint praise, but I don’t like to deal in absolutes (“BEST MOVIE EVERRRR!!!! !1”), it’s too much pressure. Instead of “Best Movie Ever” I thought about saying “Best movie of 1984,” but then I felt a little nervous about that so I wikipediad it and TURNS OUT that 1984 was also the year of Ghostbusters, Beverly Hills Cop, Indiana Jones and the Temple of Doom, Gremlins, The Karate Kid, Footloose, RED DAWN… I’ll stop there because I am not prepared to defend that kind of declaration. But also 1984 was a surprisingly awesome year for film. So there’s that. Why is Amadeus so amazing? Well obviously you haven’t seen it, so fix that. Don’t be like “ugh I hate classical music” because this movie will MAKE you like classical music. Maybe not so much that you want to run out and buy tickets to see Don Giovanni (though for the record, definitely one of the top 3 operas ever), but it’s woven perfectly into the story so you can feel and understand the drama and tension and excitement of the music itself. At the very least, Salieri’s heartfelt admiration, the awe and bitterness he feels when he hears Mozart’s music, will help convey the genius of it. The story is told from his perspective, as an old man reflecting on his rivalry with Mozart. We see how desperate Salieri is to be considered great, to have the respect of his peers. In contrast, Mozart is an arrogant, irreverent child who appears to take his own musical genius for granted. 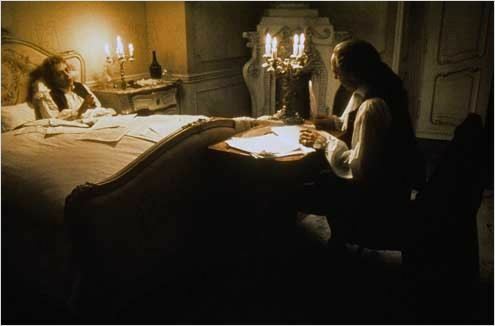 Fueled by envy and ambition, Salieri proceeds to tear Mozart down from every side, leaving him financially and mentally unstable, believing Salieri to be his only true friend. Consider this: the Academy thought it was great enough to beat out aaaall the other movies I mentioned (including GREMLINS, remember) for Best Picture in 1984. So you should definitely watch it. And while you’re at it? Watch. the. special. features. Seriously. Make the time. I’ve probably watched them more than the movie itself. Not convinced? Pull up a stool, padawan, I shall give you a teaser. Some fascinating segments reveal the drama behind the writing of the screenplay by Milos Forman and Peter Schaffer, who couldn’t stand each other; the hectic last-minute casting of Elizabeth Berridge (Constanze), who flew to Czech Republic with one change of clothes and ended up staying for 6 months; that Tom Hulce (Mozart) and F. Murray Abraham (Salieri) kept things from each other, pushed each other, competed in unique ways off-screen to make their performances as musical rivals more real. But the stories about the challenges of filming during the height of the Cold War are what really make it worth the watch. Said friend proceeds to take the hotel room apart, searching the chandelier, lampshades, telephone cords, etc. But THEN! A stroke of GENIUS! He throws back the threadbare rug, revealing a circular plate about 6 inches in diameter, anchored to the floor by two screws. He then takes a butter knife to this alleged listening device, and as the last screw is removed, they hear a resounding crash from the apartment below…. So… not a listening device, then? So there you have it. F. Murray Abraham: Oscar winner, actor extraordinaire, accessory to vandalism!! Previous Post Total Recall is a mess. LOVE it, and the pattern of discussion. Wonderful writing to keep us all enthralled and anxious to go out and take your advice, oh Jedi Master.